Clement served as legal counsel for Senate Majority Leader Michael Bishop in 2010 where she provided legal research, analysis, and advice on legislation and management of the office. In addition, she was responsible for the State Senate advice and consent process including providing reports and recommendations on appointees. As a policy advisor in the Senate Majority Policy Office from 2006 to 2010, Clement provided analysis and research to the Senate Judiciary Committee, Senate Health Policy Committee, and the Senate Local and State Affairs Committee. Clement owned and operated Clement Law, PLLC, from 2002 to 2006, where she represented individuals and businesses primarily in the areas of family law, adoption, probate, estate planning, and criminal law. Clement was licensed to the State Bar of Michigan in 2002. She graduated from the Michigan State University College of Law that same year, where she served as an executive member of the Moot Court Board. She attended Michigan State University on an academic scholarship and graduated in 1999 with a B.A. in political science. 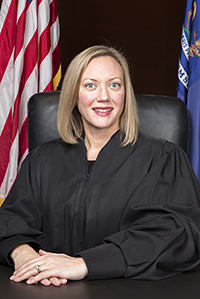 Justice Clement lives with her husband and their four children in East Lansing.